Check this out! 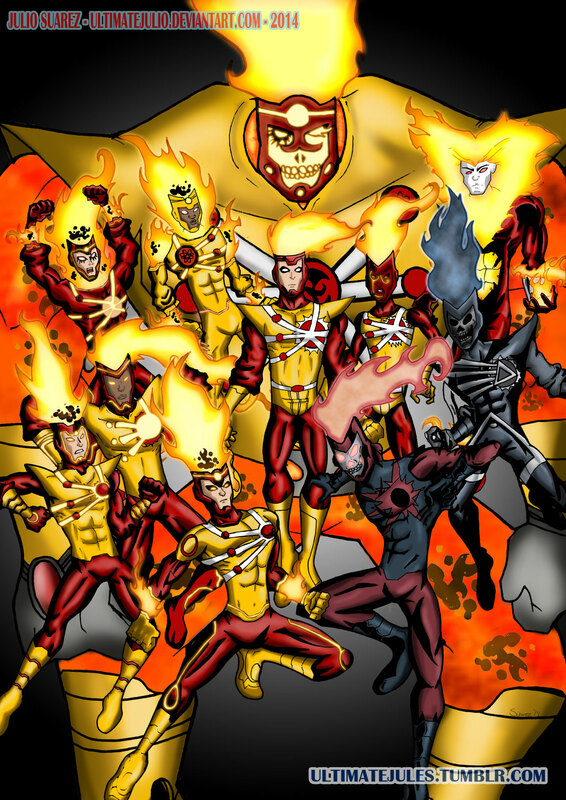 Awesome fan art featuring nearly every incarnation of Firestorm! I absolutely love it! Click the image to enlarge! The artist is a teenager from Mexico named Jules Suarez. A teenager!! How cool is that?!?! First of all, I don’t know a lot of teenage fans of Firestorm. Second, if his art is this good during his teenage years, just think how good he’ll be as an adult! Great job, Jules!! Keep up the fantastic work! Be sure to follow Jules on deviantART and Tumblr! The only Firestorm missing is the “Blank Slate” Firestorm. However, to be fair the only recognizable difference between the “Blank Slate” and the original Firestorm are the red cowl sideburns. So really, the art works just fine without it. Support Firestorm (and Jules Suarez)! Fan the Flame! Posted in: Deathstorm/Black Lantern Firestorm, Firestorm #01: Original (Ronnie/Martin), Firestorm #04: Elemental II (Martin), Firestorm #06: Jason beginner, Firestorm #07: Jason post-Infinite Crisis, Firestorm #08: Brightest Day (Ronnie/Jason), Firestorm #09: New 52 v1 (Firestorm Protocols), Firestorm #10: New 52 v2 (Ronnie/Jason), Fury, Jason Rusch, Professor Martin Stein, Ronnie Raymond, Sketch/Art. Just being technical, I would also include Bizarro Firestorm and Firestork. Very, very cool-looking artwork right there. Way to go Jules on representing Firestorm..and the numeorus ones to boot. Very cool!